The easiest explanation is we're huge. We're so huge we're wasteful so you get giant lawns and zero public transit in some larger cities. 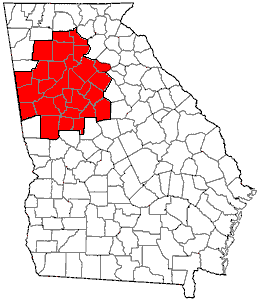 That's the Atlanta metro area. I live somewhere in there. To efficiently move from one end to another, or one county to another really, without a personal vehicle is impossible. That area has to be larger than some small countries. According to Wolfram Alpha, Atlanta is larger than Wales. You should see the street map in the part I'm in at standard zoom vs. the suburb I lived in to the east when I moved here. This place is what happens when civic planning is ignored. I think they just paved every dirt road available in the 60s and 70s and said it was good enough. I basically live in the petri dish of things that can happen when local government fails.